Brides need not worry about matchmaking when it comes to wedding flowers. From the bridal bouquets to the boutonnieres, wedding flower trends include diversity of choice, boldness of color and distinctiveness of design, according to a leading expert. Floral and interior designer Rebecca Cole is author of Flower Power, co-host of Discovery Channel's Surprise by Design and a regular contributor to the Today show. She describes leading trends. “Wedding flowers follow fashion trends,” Cole said, “and today, individuality, rather than convention is in style. No longer do the bridesmaids' bouquets need to match the bridal bouquet, the boutonnieres and centerpieces.” In some cases, each bridesmaid may have a different bouquet, according to Cole. Colorful blooms, in contrast to traditional white, also are en vogue, with lavenders and plums beautifying bridal parties. Bold and powerful arrangements dominate over the traditionally romantic. “Modern, Zen and even monochromatic designs featuring only one flower or color will in many cases replace traditional delicate mixes of flowers headed down the aisle,” Cole said. When it comes to dramatic and distinctive design, hand-tied French twist bouquets incorporating bold ribbons and pearls will make a striking statement. Cascading bouquets, a current popular selection for brides, will continue to add drama. And, table décor will become even more of a central focus. 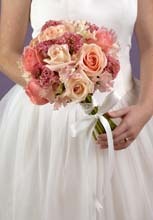 Nosegays - round clusters of flowers - are a very trendy style of bridal bouquet. Also called a tussie mussie, this style of bouquet dates back to the 14th century, when it was used to mask unpleasant odors - thus the term "nosegay." Nosegays can vary in sophistication and are therefore a good choice for any wedding. Cascade bouquets feature flowers that descend below the main portion of the bouquet design. The voluptuousness of the bouquet is often the main feature of the wedding costume. Cascade bouquets are most often used in formal and traditional weddings. Florists create hand-tied bouquets by placing the stems of the flowers, foliage and accessories in their hand and wrapping them around the center of the design until they are securely fastened. These arrangements are designed to show the natural growth of the stems, which are often wrapped in ribbon or french braided together. Hand-tied bouquets have a more casual air and are particularly nice for garden weddings and brides who like the feeling of an unarranged gathering of flowers. Contemporary bouquets are inspired by unconventional ideas, styles and patterns and are designed with no specific geometric form. They are usually created with flowers that have definite form and add character to a bouquet (such as calla lilies, orchids and anthuriums). Contemporary bouquets represent the individuality of the bride and are perfect for a sophisticated, cosmopolitan style wedding. They're simplistic but have the added grace of asymmetrical design.